Background/Aim: Esophagectomy is a major operation with high mortality and morbidity, for which anastomotic leakage and stenosis are serious complications that result in prolong hospitalization and frequent endoscopic dilatation. 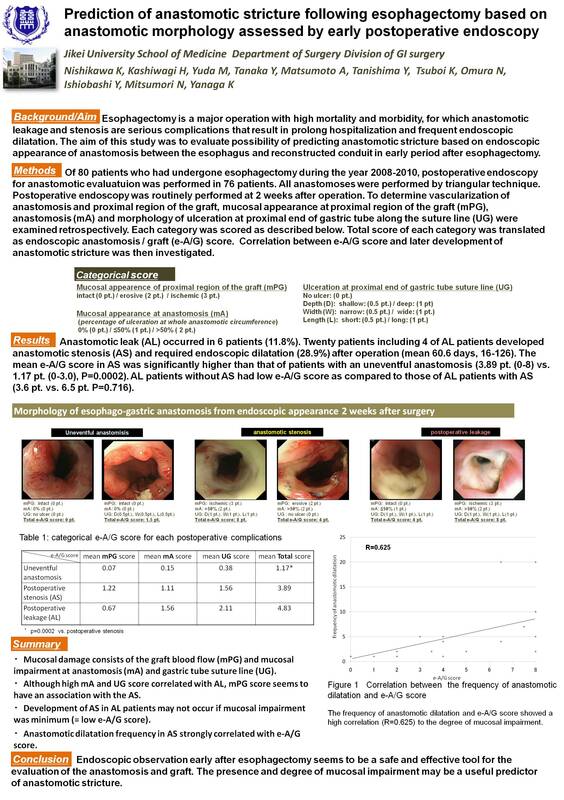 The aim of this study was to evaluate possibility of predicting anastomotic stricture based on endoscopic appearance of anastomosis between the esophagus and reconstructed conduit in early period after esophagectomy. Methods: Of 75 patients who had undergone esophagectomy during the year 2008-2010, postoperative endoscopy for anastomotic evaluatuion was performed in 67 patients. Postoperative endoscopy was routinely performed at 2 weeks after operation. Vascularization of proximal region of the graft, mucosal appearance of anastomosis, and morphology of ulceration at proximal end of gastric tube suture line were examined retrospectively and scored as follows erosive (2 pt.) / ischemic (3 pt. ), mucosal ulceration of anastomosis circumference ≤50% (1 pt.) / >50% ( 2 pt. ), and depth (deep: 0.5 pt., shallow: 1 pt) / width (narrow: 0.5 pt., wide: 1 pt.) / length (short: 0.5 pt., long: 1 pt. ), respectively. Correlation between endoscopic anastomosis / graft (A/G) score and later development of anastomotic stricture was then investigated. Results: Anastomotic leak (AL) occurred in 6 patients (8.9%). Twenty patients including 3 of AL patients developed anastomotic stenosis (AS) and required endoscopic dilatation (29.8%) after operation (mean 60.6 days, 16-126). The mean A/G score in AS was significantly higher than that of patients with intact A/G (iA/G) (4.05 pt. (0-8) vs. 0.49 pt. (0-2.5), P<0.0001). AL patients without AS had low A/G score as compared to those of AL patients with AS (4.2 pt. vs. 6.8 pt.). Although the frequency of anastomotic dilatation and A/G score failed to show a high correlation (R=0.283), the degree of mucosal impairment still affects anastomotic stricture from clinical aspect. Conclusion: Endoscopic observation early after esophagectomy seems to be a safe and effective tool for the evaluation of the A/G. The presence and degree of mucosal impairment may be a useful predictor for anastomotic stricture.